1. 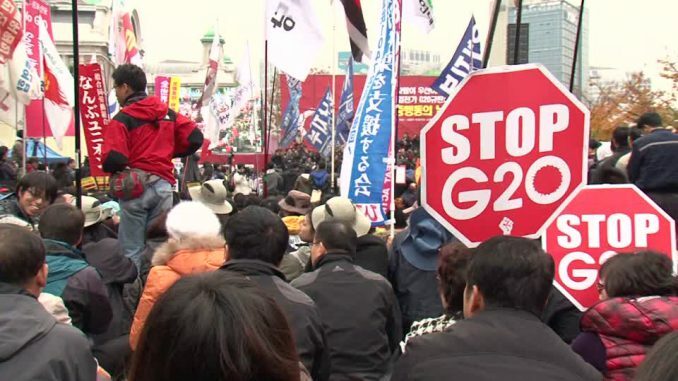 The G20 is part of the global offensive responsible for wars in Iraq and Afghanistan, sustaining world poverty, undermining labour rights and accelerating climate change. The immense harm their policies inflict on our planet and its people put cosmetic damage to one police truck at the 18 November StopG20 rally in Melbourne in perspective. These criminals – and their media allies – attempt to hide their culpability by creating hysteria about protester violence. Their aim is to discredit all militant protest action and, by extension, the legitimate concerns expressed by demonstrators. Criminalising protest will be an important weapon for the Howard Government in convincing the public of the need for an extraordinary state of security at next year’s APEC summit in Sydney. Responding to this is a major challenge for the Left. 2. Unfortunately, certain organisations – particularly Socialist Alternative and the Democratic Socialist Perspective – have completely misunderstood the challenge, lining up with the state and the corporate media to publicly denounce Arterial Bloc. In formal terms, the argument made by these groups – that mass mobilisation is the most effective form of collective action – is correct. However, they have elevated this principle to a dogma, meaning they have missed the key issue in this debate, which is the Right’s attack on militant protest in general. The first task of socialists is to take a side. In the present situation, a number of groups have taken the wrong side and reinforced the arguments of the media and the state.